Avosft Cockpit Posters: Familiarize yourself with a cockpit before ever stepping foot inside it! 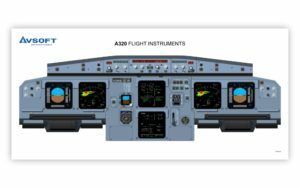 Avsoft’s Aircraft Cockpit Posters provide accurate and detailed representation of commercial aircraft cockpit panels. These professional pilot posters have proven themselves as effective ground school training aids around the world for 20+ years. Avsoft Aircraft Cockpit Posters are drawn with a focus on both photo-realism and instructional value, allowing you to familiarize yourself with a cockpit before ever stepping foot inside it! These cockpit training posters feature full color vector illustrations drawn using photos and general measurements from cockpits and simulators, so that they provide an accurate representation of colors and dimensions, as well as a detailed portrayal of the individual controls and indicators. Most Avsoft Aircraft Cockpit Posters include the following cockpit panels: flight/forward instruments, the center pedestal, and the overhead panel. Several posters include additional cockpit panels, such as: flight engineer’s station, side panels, auxiliary panels, and circuit breaker panels. The Cessna cockpit posters include the flight/forward instruments and the center pedestal, and are printed on single sheets of paper. Designed for pilots transitioning to new aircraft, these posters provide excellent supplemental reference during ground school training, including the ability to practice cockpit flows. Avsoft Aircraft Cockpit Posters are used by Airlines, ATOs, and individual pilots around the world. Avsoft Aircraft Cockpit Posters are available in three configurations: Standard, T-Bone, and Life Size. The cockpit panels are printed on three 17" x 36" (43.2 cm x 91.4 cm) sheets of paper. The cockpit panels are printed on a single 36" (43.2 cm) wide sheet of paper. The cockpit panels are printed on three sheets of paper at life size or 1:1/100% scale. "I really appreciate all your time and effort that you have put into this project for us, it really is an excellent cockpit reproduction. Many people here commented on the quality of the revision posters!"